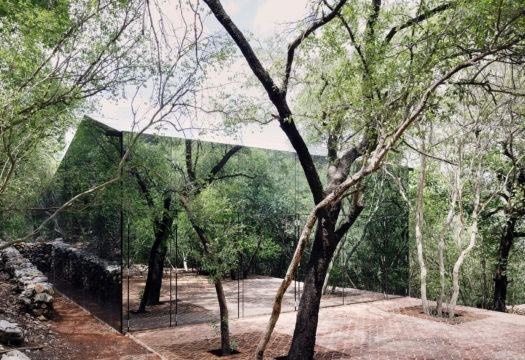 This house (project by Tatiana Bilbao) inserted in the dense vegetation of the forest makes the green undergrowth and the irregular sequence of the trees one of its design components, in a forceful dialogue that separates the daytime and nighttime areas into two specific volumes, perhaps to avoid interrupting – with a more extensive layout – the series of the trees whose proximity allows them to form a sort of seamless protective shelter. 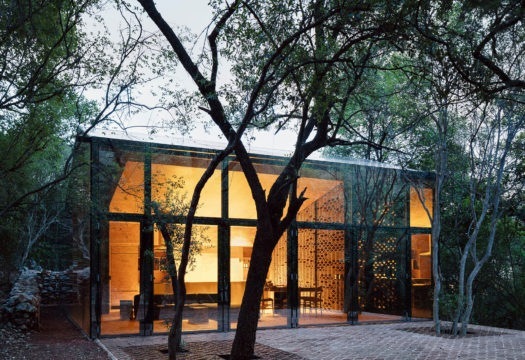 The idea of underscoring the presence of the trees, without altering them or removing any of them, is also conveyed by the choice of cladding the whole volume of the living area with reflecting glass; the panes are semi-transparent from the inside, but almost imperceptible from the outside, due to the intentional effect of the reflections that disguise the figure and size of the house, reproducing the irregular geometry of the surrounding nature, in a refined ‘dissolving’ of the architecture, which nevertheless becomes more evident in the evening, when the internal lights are on. The construction that contains the living area, with its regular rectangular form, is like a magical greenhouse with reflecting glass walls and roof, hosting a unified space organized under a double pitched roof. The living-dining zone projects outward thanks to the custom flooring made by using a special earthenware section embedded in concrete, which returns as a leitmotif in various parts of this work of architecture divided into two parts, placed at the vertices of an imaginary square. In the greenhouse-living area the glazed portions extend along the entire perimeter, wrapping a second construction formed by two bordering partitions in terracotta, conceived as ‘fixed curtains.’ This is joined by a part built in masonry for the kitchen, with the necessary service spaces behind it. The lateral terracotta partitions are made by using the same earthenware section applied for the floors, but assembled this time to form a pattern of rhomboid figures joined to openings left free, in keeping with different rhythms of assembly permitted by the V-shape of the basic part, for attachment at the ends by means of overturning or overlaying. The result is a ‘porous’ architectural screen, a large decorative materic texture through which light filters, creating a definite, protected space. The area defined by the two terracotta partitions corresponds at the roof with a suspended wooden facing that descends vertically, at the position of the kitchen, covering the masonry backdrop. The second volume is for the bedroom zone, located at the end opposite the living area with respect to the virtual square of layout reference. 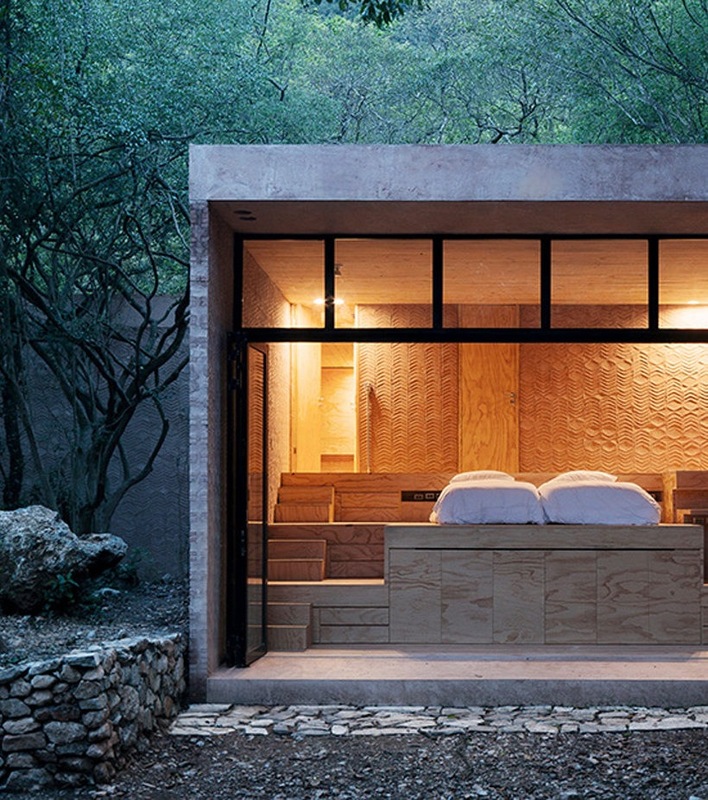 It contains two matching bedrooms with bathrooms, one rotated by 90° in an L-shaped composition. Here the construction is compact, marked by the tones of the material that adds character to the solid lateral walls, interrupted by small openings. These are composed of an assembly of the same terracotta ‘tiles’ used for the floors and the fixed curtains of the living area, joined here by earth-color mortar that enhances the vibration and the effect of a woven wall surface. 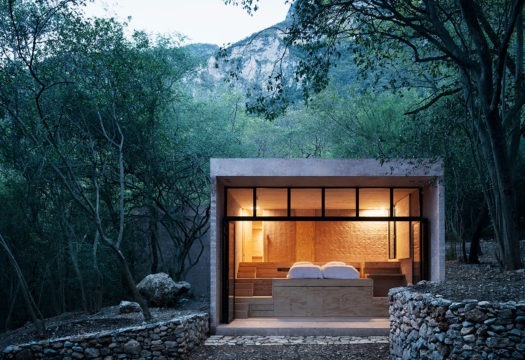 The fullness of the lateral walls forms a contrast with the large glazings of the fronts of the bedrooms, aimed outward to look towards the nearby vegetation. The roof, positioned centrally, is raised on a wooden platform that organizes the internal space on three levels with a sequence of steps on both sides, making each bedroom into an essential alcove from which to observe nature. 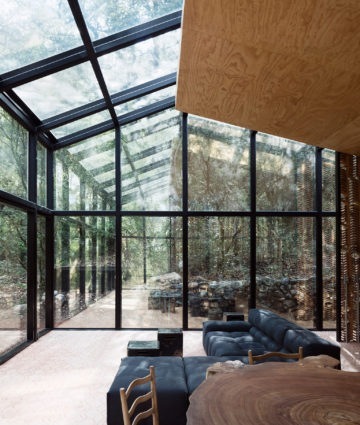 The volume of the house containing the living area; the enclosure is completely clad in reflecting glass which ‘dissolves’ the architectural figure, reflecting the surrounding vegetation. The house reveals its presence in the evening when the internal lights are on. 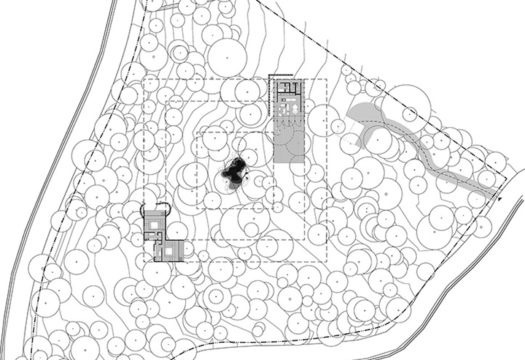 The overall plan of the house with the two volumes placed at the ends of a virtual square of reference. 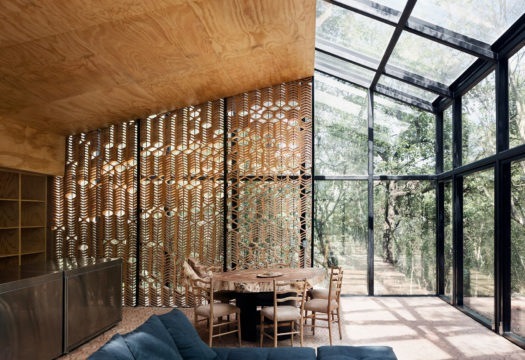 The glass volume contains a second construction made of two parallel partitions composed of terracotta parts, forming ‘fixed curtains’ that support the wooden roof. View of the dining table made with a ‘slice’ of a large tree trunk. 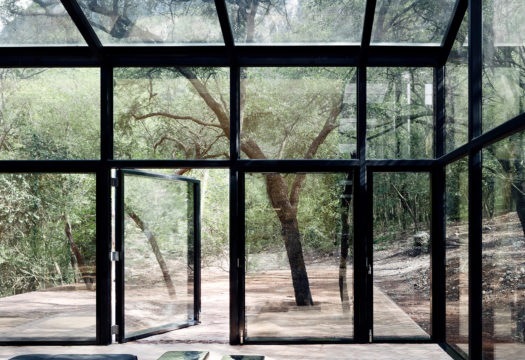 The reflecting glass creates a greenhouse effect and makes it possible to observe the surrounding landscape which becomes the protagonist of the design solution. The tile-shaped terracotta section returns as a figurative leitmotif in various parts of the construction, as in the floor that extends out into the greenery. The second volume of the house, set aside for the bedroom zone. 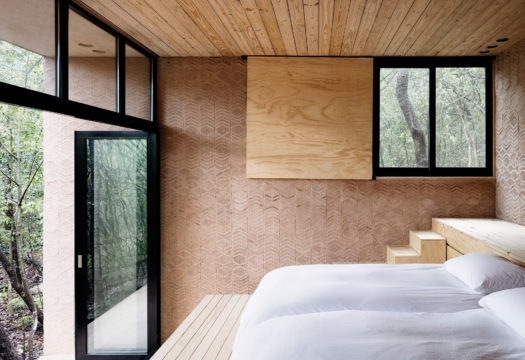 The two matching bedrooms are like architectural alcoves with compact walls, opening outward with one large glazing. The second volume of the house, set aside for the bedroom zone. The walls are made with the same terracotta parts deployed for the floor of the living area, assembled in this case with earth-tone mortar to create vibrant textured surfaces.